You are here: Home / Standing for our Soldiers – Troopathon 2010 begins! / News / Standing for our Soldiers – Troopathon 2010 begins! Standing for our Soldiers – Troopathon 2010 begins! The eight hour live Troopathon 2010 event begins at 4 p.m. ET on July 1, but you can join in and show your support by purchasing a care package or two – or 25 – today! Last year, the Troopathon raised more than $600,000 in donations. Are you up to the challenge? Our troops are, so let’s not let them down. You can help make the daily routine of our troops serving in Afghanistan and Iraq a little more bearable and thank them for their services all at the same time. Once again this year, Radio Vice Online has joined up with Ron Winter to form the cornerstone of Team Greyhawk. Sure, the Troopathon live event begins on July 1, but our special effort for this event runs for the next 10 days … so our drive for care packages starts today! A Battalion Pack ($1,000) serves 50-60 troops, a Company Pack ($600) serves 25-30 troops, a Platoon Pack ($200) serves 15-20 troops, a Squad Pack ($100) serves 8-10 troops, a Large Pack ($50) serves 3-4 troops, and a Small Pack ($25) serves 1-2 troops. 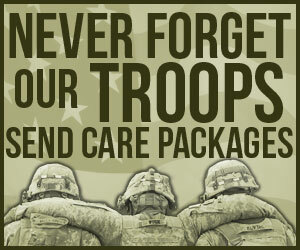 Click here to donate care packages for the troops – and support Team Greyhawk in 2010. Choose a pack listed above. Read the instructions on the page – any questions you have about the process will be answered there. We’ve heard from countless members of the Armed Forces serving in the Middle East about items that the military does not provide, are hard to come by and they really appreciate getting . That’s why Move America Forward has responded and compiled care packages that contain these goods as a way of saying “thank you” for their sacrifices and courage. Care packages are packed full of gourmet coffee, Oreo cookies, Jelly Belly jelly beans, high-quality beef jerky, trial mix, Gatorade, deodorant, Chap Stick, sun block, CDs and much more. Move America Forward is a 501(C)3 so all care package donations are tax deductible. Note: TheCampaignStore system requires a shipping address since it is designed to sell products that are normally shipped to the customer. Use your address for the shipping address. Rest assured your order will be shipped to the troops. 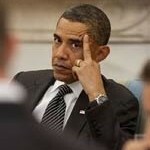 https://radioviceonline.com/wp-content/uploads/2010/06/sfos2010_banner_150x225.jpg 225 150 Steve McGough https://radioviceonline.com/wp-content/uploads/2011/02/rvo-logo-4-300x100.jpg Steve McGough2010-06-21 17:55:162010-06-21 18:34:28Standing for our Soldiers - Troopathon 2010 begins! 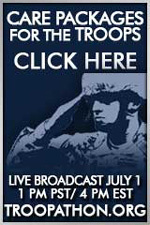 Troopathon 2011 - Watch the show live right here! Troopathon 2012 - Can you continue your support? Thanks Steve for making this so easy to donate. I regret that I procrastinate too much. The troops deserve better. I wish them all the best.